What would you do if you had the opportunity to be in a rock band? Would you take it? Here's the story of five adult students who did just that. 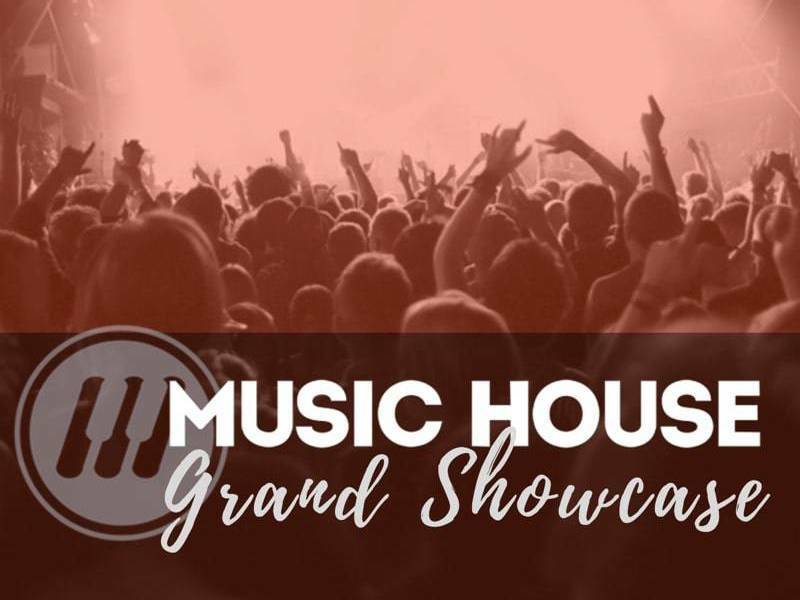 Recently, The Disclaimers performed at the Music House Grand Showcase in front of an audience of friends, family and fellow musicians. They rocked the house, but the band members were, without a doubt, the ones who enjoyed their performance the most. What was it like to perform at the Grand Showcase? "I love having the opportunity to get up in front of people and sing! The showcase is a fun way to invite my friends and family to see me sing. I was super nervous before our first two shows, now we're a lot more able to relax and have fun." "I am a United Methodist pastor by day...rocker by night. That means there are two aspects of performing with the band that are VERY different from my usual 'performance venue.' First of all, when I preach, I am a solo act; just up there by myself doing my thing. With the band, it's fun to be part of a team and have to coordinate with them and make sure we are all working well together. I feel very blessed that this band is made up of a group of people who are really great and fun to work with, and who willingly suppress individual egos for the sake of the group's success. "The second thing that is VERY different for me is that when I finish my Sunday morning "performance," there is always silence. I assume (and hope) it is a reflective, respectful silence, but it could well be the silence of sleeping. To finish playing a number with the band and hear people WHOOP and WHISTLE and cheer is different and exhilarating. Frankly, the first time it happened it took me by surprise. But I really liked it!" "We're really enjoying the adult band. This was our third show and it keeps getting easier for us as we become more confident. We love working towards performances and expanding the song list. Being on stage is the best!" "This was my third performance, each one a longer set. I felt more comfortable this time and was able to actually enjoy it." "This was our third Showcase, and I think our best. Everyone was relaxed and having fun. It was a total blast to perform in front of a crowd!" What kind of response did you get from those who saw the show? "One of my friends, who is a huge Led Zeppelin fan, said "That was pretty brave to attempt to sing Led Zeppelin! She meant it in the best way possible." "Only my wife was there to see, but she thoroughly enjoyed seeing me up there. Of course, when we finished and were back in the green room, all of us immediately apologized to the others for messing up this chord, or that note or this vocal, but we were still kind of floating on air a little from the sheer enjoyment of the moment." "They said we're getting better. My daughters approved of my updated apparel--they were adamant after the second performance that it was not appropriate to wear a Talbot's blouse to play the bass." "When we finished and were back in the green room, all of us immediately apologized to the others for messing up this chord, or that note or this vocal, but we were still kind of floating on air a little from the sheer enjoyment of the moment." What do you do outside of Music House? Does this interview make you wonder how The Disclaimers have the time to be in a rock band with their busy schedules? Each band member makes the integral time commitment to practice and rehearse with one another. "I worked for Hallmark as an editor and editorial director for 15 years. Now I'm a grad student in social work. I'm very busy, but I make time for my Music House lessons and band practice on Fridays. Our band practice is, without question, the highlight of my week! Not only are my bandmates hard workers and good musicians, they're also a lot of fun to be around. Our 50-minute practice goes by way too fast!" "I'm an IT guy. I have been in healthcare IT for 22 years. I grew up with band activities in high school and college. This experience has been like therapy...It's a way to activate the other side of the brain and get some mental 'balance.' I plan on continuing lessons...By the time I retire, I want performance to be a major part of my life." "I'm a pediatric anesthesiologist, which is very gratifying, but can be pretty intense. I took up the electric bass a little over two years ago because I came to the realization that rock music calms me. Several of us call our weekly lesson our 'music therapy.' 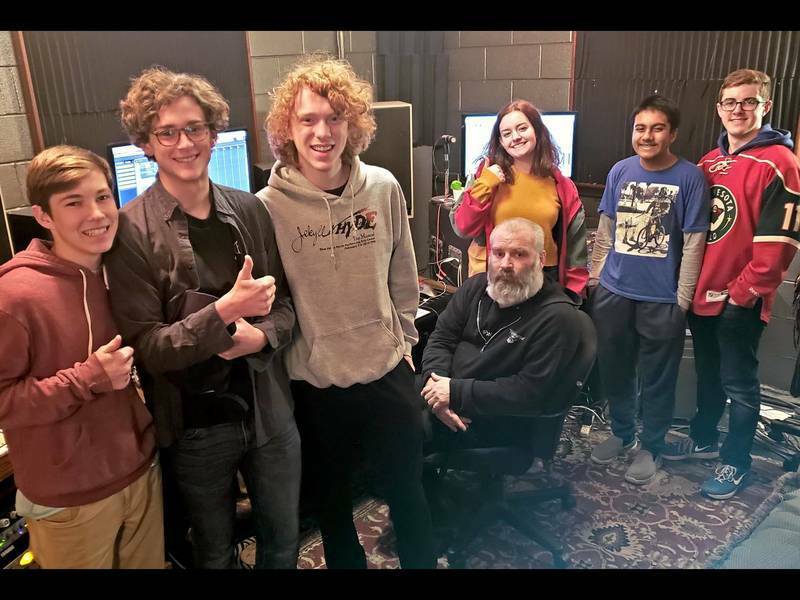 I thought I would be satisfied playing along with music in my basement, but when Becca (Music House teacher Becca Kephart) encouraged me to play with the Music House adult band, it turned out to be a wonderful, enhanced opportunity to enjoy my new endeavor and to improve along the way." "I worked in Visual FX and the Video Game industry for 25 years." "Our band practice is, without question, the highlight of my week! Not only are my bandmates hard workers and good musicians, they're also a lot of fun to be around. Our 50-minute practice goes by way too fast!" "Being lucky enough to be a part of this band and work with our bandleader, Drew Little, is such a privilege. We want to keep on expanding our catalogue and perfecting our performances so that our audience gets the most out of coming to see us. Singing in a band is something I dreamed about but never thought I'd have a chance to do in real life and I love it!" "We are all grateful to Music House for including this performance aspect in the overall program for learning. It makes [learning music] so much more enjoyable." "I'm thrilled to have Music House for activities like this. It's been invaluable to me. More adult students would be great. I share this experience with anyone who will listen." "My previous experience with music was playing the flute in band in school, as well as singing in choir, sextets, and Madrigal groups in my youth. I tried to learn to play the bagpipes about 10 years ago, but didn't pursue that very long. This instrument is very different, but it's so much fun!" "I played music in high school and college, but had never really performed much in public. The band at Music House gave me the confidence to play on a stage in front of a crowd. I might be addicted now!" "I love teaching this band, because you can see them unwind from the work week and have fun together. " Each week, members of The Disclaimers take private lessons and attend a group rehearsal. According to their band teacher, Drew Little, they're always interested in learning increasingly challenging songs that they love. For their most recent showcase, their setlist included "Rocky Mountain Way" by Joe Walsh, "I Want You to Want Me" by Cheap Trick, "The Ocean" by Led Zeppelin, amongst others. Drew enjoys working with The Disclaimers. "I love teaching this band, especially on Friday night, because I can see them unwind from the work week and have fun together. Conceptually, they find their role in each song very quickly, and know how to immediately focus, which makes a very productive environment. They also have a great appreciation for the song list because they all grew up with it as their soundtrack. Seeing adults complete music goals is very exciting because you know they really want it! It's hard as an adult to find time to commit to difficult songs, but they hold each other accountable, and strive to get better together." Want to play in a rock band? Check out Music House.